Zero to 100 in 60 Seconds Flat. The Little Wonder BedShaper cuts crisp clean edges, even “S” curves, up to 100 feet per minute – making short work of even the largest edging, bed shaping, and trenching projects. The most intricately shaped beds, smallest diameter tree rings, and tightest curved edges are a snap with the BedShaper. 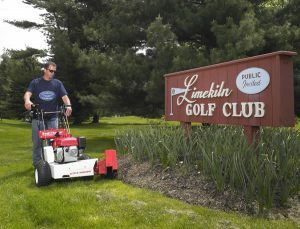 With features like added differential and zero-turning radius that offers outstanding maneuverability and precision, a hydrostatic transmission for infinite speed control in forward and reverse, multiple engine options and cutting depths ranging from .5 to 4.5 inches, the Little Wonder BedShaper has the power and versatile to perform a variety of tasks – cutting costs nearly as fast as it cuts through turf. Built for professional landscaping and grounds maintenance professionals, the Little Wonder BedShaper stands up to the riggers of all-day everyday use. The frame is constructed from welded, formed high gauge steel and the powerful 16.25” diameter notched blade is made from heat-treated spring steel and is guaranteed against chipping, breaking, bending, and delaminating for life. The BedShaper is loaded with unique features; the BladeFloat™ feature allows the blade arm to travel over tree roots and rocks while continuing blade engagement for hassle free cutting around obstacles, the Shape-Trak™ design mounts the blade in-line with the drive wheels so the blade follows the exact path of the wheels for the most precise edging, and the spring-loaded belt idler is fully enclosed for maintenance free operation.